MBT stands for Masai Barefoot Technology. MBT has also become almost a generic term for rocker sole shoes. A rocker sole shoe or rocker bottom shoe is a shoe which has a thicker-than-normal sole with rounded heel. 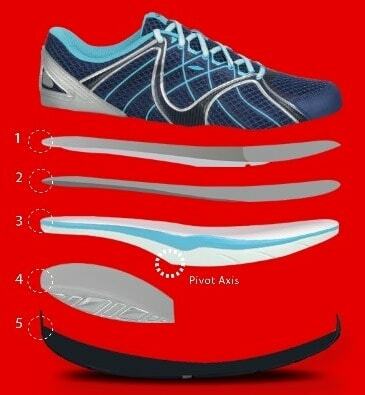 Such shoes ensure the wearer does not have flat footing along the proximal-distal axis of the foot. The shoes are generically known by a variety of names including round bottom shoes, round/ed sole shoes, and toning shoes. Branded generic rocker sole shoes were popularized for the mass market in the late 1990s and 00s by the Swiss Masai company as Masai Barefoot Technology or MBT. The shoes were invented by a Swiss engineer called Karl Müller in the early 1990s. He noticed, on a visit to Korea, that walking barefoot over some soft paddy fields alleviated his back, knee and Achilles tendon problems. He also discovered that the Kenyan Masai tribesmen don't suffer from back pain and are famous for their perfect posture. Putting these two pieces of information together, Muller reasoned that this was because they walk across ground that yields underneath their feet. Walking on hard surfaces, such as pavements, that don't have any "give", he concluded, has not been good for our backs, knees, and ankles. Muller decided that the answer was a shoe with a curved sole, effectively with no heel, which mimics the rocking motion of a foot walking on soft sand or grass. The first prototype of the MBT trainer was constructed in 1996 and by 2000 approximately 20,000 pairs were sold in Switzerland, Austria and Germany. In essence MBT is a redesign of shoes to cause the user to have to balance while they walk. MBT shoes create natural balanced walking posture. MBT shoes can change the way most of us use our muscles as well as reduce shock forces to the entire skeletal system. Masai Barefoot Technology makes all surfaces like walking in sand. Unlike most conventional training shoes that only support and cushion your feet, the unique lever spring action of MBT's challenge the core strengthening muscles to be more active. According to the company that invented the shoe, this helps create good posture and increases shock absorption for all the joints. Apparel Search does not know if the shoes truly provide benefit or not. Please conduct your own research and investigate all medical benefit claims. If you are looking specifically for MBT brand shoes and not just any heel-to-toe rocker, you can visit their website to learn more about authorized retailers. The patented MBT® SensorTechnology™ produces what has been described as a pleasant and natural feeling, reminiscent of walking on a sandy beach. The Pivot Axis promotes a rolling movement, which in turn may help increase lower limb muscle activation in your every step. Read more fashion terms here on Apparel Search. We hope you have been enjoying your reading.